Twelve Red Crossers from all over the world – Britain, Canada, Japan, Germany, Australia, Switzerland, Malaysia – have come together ahead of a Disasters In Developed Countries workshop in Melbourne. We visit our NZ cousins and hear the wisdom of their words following the tragic earthquakes in Christchurch in 2010 and 2011. A flying visit to New Zealand takes us from Auckland, to Wellington, to Christchurch in less than thirty hours. On the hotel courtesy bus from Christchurch Airport we look at each other, trying to remember how long ago we met, and realise it was only the morning before. It already feels like we have been through so much more than that together. It’s always hard leaving at the end of a long stint. I am always desperate to get home, and at the same time reluctant to leave. I pack my bag and leave a thank-you note for John and Alison at the Thistle. happily, my last taxi ride in ChCh is the lovely John, who again refuses to take any payment and gives me a big hug as I say goodbye. I sit in the EOC, pulling together a couple of recovery planning documents as my last contribution. Somebody brings me a flat white with an extra shot: probably a bad idea. I’m hyper enough already. Suddenly my travel plans change.I need to be up in Wellington far earlier than planned for my debrief. I run around saying some hurried goodbyes, and then it’s off to the airport. At the Red Cross national office, I sit chatting with Aaron, sharing stories. A wave of tiredness washes over me. It’s probably a really good time for me to head home. My debrief doesn’t happen in the end: something about a meeting with the minister. Never mind: we’ll do it by phone later. I head for Cuba Street and the quietness of a hotel room. you can drink the water from the tap anytime you like. you have your own flushing toilet and shower. Bliss. there is space on your hotel room floor to lie down and stretch out if you wish. the earth doesn’t shake gently every hour or so, like it was doing in ChCh just before I left. the minutiae of the earthquake response does not dominate all news programmes. I don’t have to think so much about night-time protocols (but I do anyway – I’m actually close to the fault-line here). I do a bit of discreet knocking to check out the relative strengths of the walls in my room to help decide which doorframe to run to if anything happens. I meet Claire for a bit to eat. We chat over Indian and Malaysian food, and make short work of a NZ shiraz. My focus slowly starts to return to normality as the conversation stops being dominated by the earthquake, and news and gossip emerge from the world outside ChCh. A nightcap in the Havana rumhouse is a lovely end to the night. I sip at a beautifully made Zombie (I never find out the secret ingredient) and vow to have an alcohol-free week when I get home. In bed I wake a couple of times, convinced I can feel the room shaking. Next morning I check Geonet. Nothing in Wellington at all. I am now officially imagining things. What I don’t imagine, however, is the main electric light coming on of its own accord around four in the morning. I awaken, panicked. I can’t explain it. My last few hours in NZ take me down Cuba Street on a sunny autumn morning. I buy a new pair of earrings and breakfast like a queen in Ernesto’s. 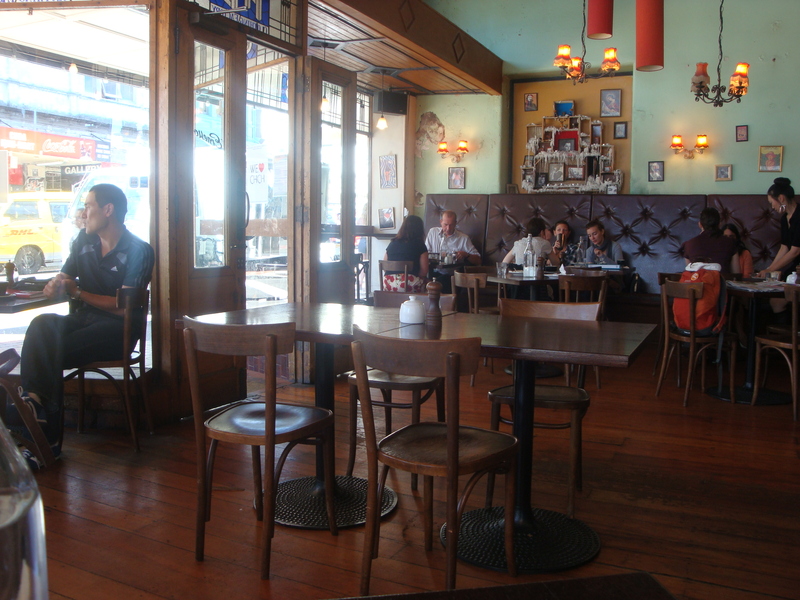 The quirky style of my fellow diners is classic Wellington. Even my (female) server has a nicely-trimmed moustache and winged Doc Martins. A “We ♥ ChCh” poster in the window is the last hint I have of the world beyond the trendiest street in the capital city. I collect my bags, and head for home at last. Six in the morning finally feels too early for me. I’ve been up between five and six in the morning for two months now, but today it all seems too hard. I am not the only one, it seems. For some reason, the Red Cross garage is not running as smoothly as usual. The cordon crews are running late – they were not told about their 07.30 briefing. Most of the incident management team are also late. Carolyn, our new counsellor, slept right through because her alarm didn’t go off. Nobody can find the shiny new maps I brought yesterday. It is cold and raining. The city centre cordon is being shrunk today, to allow some more business owners and residents back to their buildings. The queues are long as people inch past the police and military checkpoints. At least the soldiers and police are cheerful despite the miserable weather. Men in trucks and women in shiny new cars drive slowly through their local streets. Finally after almost an hour Hayley drops me within walking distance of the art gallery. Japanese TV cameras film us as I walk along. Anxiety levels are high. Concerned residents speak anxiously into mobile phones as they approach their homes. Building contractors line the streets, heading to inspect some of these buildings for the first time. People unused to driving within the cordon tailgate others who are respecting the 30km per hour limit. They just want to be on their way. Our volunteers sit in the two local information centres, waiting to accompany people on their first visit to their green, yellow or red stickered homes. The Welfare section is its usual frantic pace, but it feels a lot more homely to me now I know a few faces. The phone rings constantly, and a steady queue of people wander up with questions. I even get a big fireman today. Nice. The morning operations briefing is friendly, to the point and very informative. The queue for coffee is pretty good. The day is looking up. Sitting on what turns out to be a lengthy call, I look up and see a handsome young policeman standing in front of me. First a fireman, now a policeman, I think. Marvellous. He is perhaps mid-thirties, good-looking in an understated way, and in full regalia including a peaked cap and stab vest. He waits patiently until I finish, then asks, “Are you Red Cross?” “Yes I am, can I help?” He thrusts two twenty-dollar notes into my hand. “This is for you. Make sure it goes to wherever it’s needed. You guys are doing a great job.” Whatever trials the day has held for me melt away. A policeman telling us we are doing a great job? People are just fantastic. Later in the day I accompany an outgoing colleague to the airport to do a handover. We sit drinking tea and I write notes frantically as she talks. I spend a lot of time in airports, so I know what an airplane taking off feels like. This is different. I sense the vibrations coming up through the floor at me, rather than through the air. Carolyn sees me looking around and tells me it’s an airplane I feel. I disagree. Carolyn says she can’t feel a thing. Why would she? She’s from Wellington where the floor shakes all the time. Less than a minute later, she interrupts herself. “That was definitely one.” All in all I felt about four tremors in a row – or perhaps one long one. Turns out it was another 4.9er, but almost 200km away. A change of scene: I head to the centre of Christchurch, to the art gallery. Less than five years old, it emerged relatively unscathed from the earthquake on 22 February, with not one of its hundreds of panes of glass even cracked. As such, it made a perfect location for the multi-agency Emergency Operations Centre, and I am to be the Red Cross Liaison Officer there today. We drive along towards the central cordon, two colleagues and myself. Within minutes we reach the outer cordon of the CBD, where traffic is controlled. The driver, a Cantabrian herself, remarks that she never imagined seeing armoured tanks and military personnel on the streets of her home town. The cordon is a serious one. We stop the car and the young soldiers inspect our photo ID with care. Round here we can see a number of commercial and industrial buildings with the red graffiti on the front, showing that they are doomed for demolition. The further we go within the central cordon, the more beautiful the buildings become and the sadder it is that they have been irreparably damaged. Walking the few blocks from the car park to the art gallery, the quietness is deafening. These streets should be lively on a sunny Saturday morning. Instead, the only movement is that of cars with lights and sirens on, and people with various uniforms on, all heading for the same building. We pass by the media tent where many Asian and worldwide TV outlets wait. As we enter the building we navigate the hand wash checkpoint (every earthquake brings a risk of gastric problems with it) and the sign-in table. The Red Cross table is in one of the galleries off to the right. All of the paintings are gone now, taken down yesterday for protection. I was sort of looking forward to spending my day gazing at works of art when working. In the foyer a large advertisement heralds the coming of “De-Building: … inspired by a moment usually hidden from viewers – when an exhibition ends and the “de-build” begins.” Who knew? Angela and I make a base camp at the empty Red Cross table and start getting our bearings. I wander next door to Strategic Planning and Intelligence, and head up the beautiful staircase to find where the Recovery team lives. Angela finds our outreach coordination people in the adjacent gallery space. Their day is starting off at a relaxed pace, but their afternoon will get frantic as two landslides threaten more than a hundred homes and the workload increases exponentially. The art gallery café is still operational, but for free. Workers can wander in at any time for a cup of tea, a latté, a slice of cake, a piece of fruit. The lunchtime queues form quickly for chicken cacciatore or noodles or salad or a sandwich. A desk out on the foyer has box upon box of bottled water and Powerade. The Planning Intelligence guys don’t have much to offer as yet in terms of recovery data. The Public Information and Media team are working in an interesting space, where “the rumour mill” whiteboard is given as much attention as fact. They know that out there, perspective is reality. There are more than seventy or eighty people in this gallery space. The noise is deafening at times, with everybody talking to each other and on the phone at the same time. Suddenly the earth shakes and for three or four seconds, the whole room goes silent. I stand in a strange automatic surfing position (legs widely-spaced, knees slightly bent, arms a little outstretched) as the wall opposite me flutters lazily like a heavy curtain. That was a big one. Later I find out it was a 4.1. I wonder how anybody thought this was a slow gig. People from strategic planning, welfare, Pacific Islander Affairs swing by the desk, passing on information and requesting help. I attend a couple of briefing meetings and manage at some point to visit the portable toilets parked outside, hoping nothing seismic will happen while I am on the throne. Somebody wants to know where we think the transportable shower blocks should go first when they arrive. In between phone calls I develop some briefing notes for my successor, and wish they had left some paintings behind for me to gaze at. Before I know it, it is past five o’clock and my colleagues from the outreach coordination desk are ready to go. We stand outside in the freezing cold waiting for our lift. Jenny is three weeks away from her wedding, but still she turns up every day for shift. Red Cross is important to her. She points out a nearby high-rise building, and tells me she was up on the sixth floor the other day. The whole building is deserted, but tomorrow residents will be allowed back home for the first time. She tells me she would not want to be returning there. They are beautiful homes, she says, but their contents are destroyed and the view from their once-envied windows will be heart-breaking. Back at base, I chat to my fellow Red Cross workers. Some have had bad days, others are worried that the tiredness has not hit them yet. A couple of colleagues from Melbourne have now arrived and their familiar faces are so good to see. I brief the Incident Controller after my day, and am gratified to hear most of what I tell him included in the team briefing just before dinner. It is Saturday night and some of us are determined to have at least one team dinner. Before I go I have a quiet conversation with a colleague who had a particularly stressful day. It’s what I was brought here to do: provide peer support to fellow Red Cross workers as they go about their jobs. We sit in a small room upstairs on a couple of comfy office chairs and I listen to the story of her day. Just as we finish our chat, the building starts to shake. It’s a serious one this time. My colleague – a Kiwi herself – instinctively jumps to her feet, opens the office door and stands within the doorframe. The building is really shaking at this point. Others outside hold their dinner plates in hand, trying not to spill gravy, whilst others try to stop the white plastic garden table from migrating across the room. Graeme tries to dive beneath the table. I’m not sure what protection it would have afforded. I watch as the wall opposite me curves and sways. Downstairs, Jacqui looks out the window and sees waves forming on the rain puddles in the car park. She is with four Australians and they freeze to the spot, waiting for somebody to do something. After what feels like an eternity, but was probably fifteen seconds, the movement slowly stops. My heart is still racing. I sit back down abruptly. My colleague looks at me sagely and suggests that I should make my way quickly back to the doorway. I’ve never moved so fast. Later over a glass of wine in a suburban ale-house, we learn that the quake we’ve just experienced was a 4.8. Graeme is surprised. He reckoned it was at least a 5. I am not sure I would like to experience anything more than this magnitude. I knew within a couple of seconds that my options were limited and that my survival was subject to sheer luck if the quake got any worse. Earlier in the day, a colleague in the EOC told me that most of the people in her sixth floor council office on the 22 February had been thrown around so much that one colleague had carpet burns. Back in my tiny room I position my hiking boots a little more carefully by the bed this time. There have been fifteen quakes today, all above 3.0, and two above 4.0. What a day. Another early start. I put the kettle on and watch the news in Maori. By seven I am in the office with a cup of tea in hand, chatting to some volunteers before they start their shift. Some are off to the welfare centres, others to walk the suburban streets checking on residents. A select few are heading to the CBD to assist with the USAR work. We have a team meeting and plan our day. There are non-Emergency staff working upstairs who have been heavily impacted by the earthquake themselves, as well as the emergency workers themselves. One lady has no power or water at home, and their house has been moved on its foundations. It is still fit to live in – so far – but the lack of electricity and water is getting to her. She was at home when the quake hit, and watched as the street outside her garden cracked and swallowed itself. She was trapped in her house for four days. She comes to work early in the mornings to have a shower, and her workmates around her help her through the tough days. Her elderly neighbour patrols their suburban street every night with a torch, waiting. Waiting for trespassers, a gas leak, the next quake. A lady walks off the street and offers to volunteer for us. She has been displaced herself and is living with family friends, but does not feel like one of the unlucky ones. A fresh juice supplier calls in with 60 boxes of freshly-squeezed fruit juice for the welfare centres. An older man and woman get help from our lovely receptionist upstairs about what assistance they can get access to. A gang of amazing young university volunteers sit in a meeting room with their own laptops and internet connections, working off community databases, Facebook and anything else to reconnect missing people with their loved ones. Less than a week ago they knew nothing about Red Cross and now they make up one of the core teams. Downstairs, Steve’s Emergency Operations Centre takes shape. Tables are configured into Operations, Logistics and Planning pods. There is even an EOC Manager space. I still can’t tell anybody apart (no tabards) but he and his team work hard all day, and the structure and discipline grows around them. It is impressive work. We celebrate the little wins. A new fridge. Plenty of crackling on the roast pork at dinnertime. The beautiful sunshine and warmth, despite a blustering nor’westerly. Cake and more cake – handmade, delicious and donated by grateful citizens. A shiny new organisational chart on the wall by evening. We chat to staff and volunteers as they come and go. They are tired, and they know it. Most are supporting each other really well. Later in the evening two reunited team-mates embrace in a bear hug for a good minute or two. One lady comes back from shift, queues up for a hot dinner, hops in her car and drives home with the full dinnerplate on the seat beside her. A sixteen-year old Christchurch team member takes a crash course in media handling and becomes assistant National Media Advisor. A veteran of Hurricane Katrina, she and her four siblings are at the heart of the Christchurch crew. The team leaders talk about how to support their teams better, how to run a good hot debrief, how to recognise the symptoms of the ones who need a little more help. A new team from Auckland arrives, old friends who have helped before, last week and last year. The locals hail them when they see the familiar faces. It’s good to be back, they say. Chatting to a couple of team members before dinner, I ask a local how you ever get used to the earth moving. We have a funny discussion about the correct night attire in an earthquake zone (something modest and acceptable to wear on the street!) and I am glad I packed my fleecy pyjamas. Thanks Dad.Then I ask when is it appropriate to evacuate. “Oh,” one of them said, “I am getting a bit lax about that. You feel a bit of a shake and then it stops, and you think you are OK. Another time the shaking goes on a good deal longer, and you reckon it’s time to leave, but you can’t be bothered moving.” So when is it definitely time to leave? “ If you are in bed and the tremor is strong enough that your body is being moved about, it’s time to evacuate.” Seriously, if that was happening to me, I am not sure I could move out of sheer panic. The USAR crew are late back. They’ve been decontaminated as a precaution and they are all wearing white Tyvek jumpsuits. It’s been a day searching through the rubble, not sure what they are going to find. Their Red Cross overalls will need special deep cleaning tomorrow. It’s been a long, hard day and they look worn out. Thankfully they get a day off tomorrow. Somehow, inexplicably, it is past ten at night and we’ve been here fifteen hours. A very long day, and it won’t be that long again. But there has been some good work laid down, some support mechanisms reinforced, some one-on-one chats to help. I get to the end of my first full working day without the earth moving again. Back at the Thistle, I have been moved into a single room from my palatial twin room. It’s barely three metres square but has everything I need, especially a comfy bed. I know the drill tonight: boots by the bed, well-thought-out night attire, phone on charge ready to grab. My little table is far too small for anybody but a ten-year-old to hide under, so the doorframe will be my refuge. As I get ready for bed I hear a low rumbling, growing in intensity. Instinctively I reach out to steady myself against the inevitable swaying of the building, but it turns out to be a distant truck or plane. I relax, but not completely. It’s a long day after waking up at three in the morning. Why do we always feel we will miss the alarm? The flight to Wellington is delayed by an hour. I try to finalise a few budget tasks while I wait. I watch a movie on board and try to relax for the final hour. As we make our descent, I know New Zealand is falling silent as two minutes of silence are observed to remember the dead. It is exactly a week since the second earthquake hit. As I queue to disembark, the man beside me asks if I am headed for Christchurch. “Good luck”, he says. Across town in the New Zealand Red Cross building, we are greeted by the head of Domestic and International Operations and briefed by the HR Manager. The building is amazingly quiet. Most of the action is, predictably, down in Christchurch. Angela and I head back to the airport for a turbo-prop flight down. As we enter Christchurch airport complex from the apron, a safety sign says “Welcome to Christchurch Airport. Caution: Uneven Surface”. Some wit has added to the bottom: “AND WOBBLY TOO”. It is after seven by the time we find our Red Cross building. Yet again, it seems, Emergency Services have displaced First Aid training. Dozens of Red Crossers mill about, many in professional-looking red overalls. A handful of our Japanese colleagues are also in town. Their uniforms are even more impressive, with first aid kits on their belts and serious badging. I recognise Steve and Graeme from their trip to Queensland to help us, and a couple of Tracing colleagues. Wasn’t Catherine last in Brisbane in the Planning team? She is happier back in her comfort zone, doing what she knows best. I cannot get my head around who is who. I know I am a stranger, but it has been a while since I have walked into a Red Cross operation and not been able to recognise structure and hierarchy by the colours people are wearing. How can you tell who is in charge? Who are the Logs people? Where am I staying tonight? Where – and who – is my team leader? Are all these people coming off shift, or is it a shift changeover? How long have they been working today? We queue for dinner. Roast chicken with all the trimmings by a local rotisserie caterer. I eyeball my new colleagues. There are quite a few tired faces here, a bit of bravado by one or two, a few others a bit too quiet for my liking. Steve, the new Incident Controller, briefs everybody outside after a team photo and the crowd begins to disperse. As the “welfare team” we get a very brief introduction by Kristen, our team leader, and set to work leading a hot debrief for the local Christchurch team. They have not been working together, but start and end the day together. They have been doing Operation Suburb, USAR, welfare centres, logistics, you name it. They express unhappiness at non-locals coming in and taking photos. Some of them have gone back to their regular work today – one is happy to get back to some sort of normality, whilst another just has to go back because he has run out of leave. Yet another is working a full shift with Red Cross as well as a full shift as a nurse. One guy had been rostered off but came in the evening for the briefing. This is their town, and most are going home to damaged homes, missing friends, no water, intermittent electricity. The camaraderie is pretty good but their resilience is wearing thin. We recommend EAP to them and remind everybody including ourselves about the “oxygen mask rule”: you have to look after yourself first before you are able to look after anybody else. It is past nine at night and most of these people have been on the go since before six in the morning. Steve is aiming to get the shifts down to twelve hours. He walks the halls sending people home. The Thistle guest house is a few minutes away by car. John is most welcoming to his old-fashioned but comfortable digs. I eye the washing machine happily. I’ll need that later in the week. My room has two single beds, a wash-basin with a single cold tap, a big TV, plenty of fresh towels and a kettle. We have to boil all the water before we drink it. The bathroom is down the hall. I try not to disturb my backpack too much: what if I have to make a sharp exit in the middle of the night? They have already had a tremor measuring over 4 on the Richter scale this morning. I position my hiking boots right by the bed and leave my trousers and high-vis jacket within arm’s reach. My mobile phone is to hand and can double as a torch. I eye the fire exit: it’s a jump out the window to a secondary roof below. I think I can make it. I consider what to wear to bed. What if another quake hits in the middle of the night? How long does one wait until it is time to jump out of bed and hide under the table/ under the bed/ in the doorframe? Are my bedclothes appropriate to be seen in on the street? I’ve not felt the ground shake yet, but it is only a matter of time. I only hope it doesn’t happen on my first night. Less than a minute after I type that sentence, the bed shakes. The room shakes. The earth quakes. A car alarm goes off down the street. It lasts no more than five seconds and the bed doesn’t sway more than a few inches to each side, but I don’t like it. I don’t like it at all. What do you pack to travel to an earthquake zone? I hurry home from a relaxing weekend away by the ocean, to a last-minute travel health check and a few hours at home before heading to New Zealand. I have been busy these past two months with Australian disasters. Floods, more floods, cyclones, fires, and yet more floods. My packing has become quicker and tighter every time. Don’t worry about a book or a Walkman: you won’t have time. Only pack one or two non-Red-Cross pieces: you will end up eating dinner in uniform every night in the canteen. Forget about makeup (well, except eye-liner – remember when the Governor-General visited?) and always double-check you have enough hairclips otherwise you will faint in that Brisbane heat. Other things not to worry about so far: a bed for the night. A shared bathroom. Sweaters and rain jackets. This time I am not so confident. I am told I will have a bed in a motel, but really? In an earthquake zone? I pack a sleeping bag, inner sheet and carry-mat anyway. And socks to wear when it gets cold. And cover-all pyjamas in case there are communal facilities (or another earthquake in the middle of the night). I carry my trusty Red Cross high-vis jacket and my incident management folder like comfort blankets. Extra medication, thermal vests, teabags, own mug and water-bottle, a Swiss Army knife and at least one torch. I feel like I am going camping again.